For those that don't know him, Fred Dibnah is a very popular steeplejack and steam engine fanatic from Bolton, Lancashire. Following many colourful TV documentaries, he has become almost a household name. 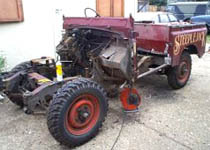 So when we saw he also had a Land Rover, albeit a series 11, we decided to see if there was anything we could do to help, and that was our first mistake, as we ended up doing rather a lot more than we had expected. 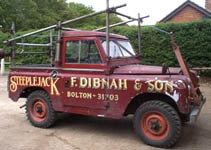 The land Rover as it was. Complete with Fred's tools of the trade This is what she looked like when recovered to our premises. From a distance all looks in fair order, but as we began to strip it, the horrors of a series 11 became all too apparent. We would like to take the opportunity to offer our thanks to Marsland Chassis and JSF Landrovers for their assistance in this project. RPi can supply all chassis options from Marsland if required. In the process of a complete strip down. When I said rather a lot more, this was an understatement. 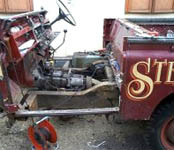 The idea originally was to convert it to unleaded for him, but after the journey to our workshop it seemed that if this vehicle were to ever go back on the road it would need some serious rebuilding. Like most jobs, the deeper we went, the worse it got, So we decided there's nothing left but a total rebuild and our efforts have been well rewarded as you will see from the details in this section. Just a rolling chassis now. Well, we had no choice, strip it completely or Scrap it !!!. You cant see it, but this chassis has had it, close inspection reveals not only many many gaping holes and corrosion, but also many previous repairs that are no more than patches welded onto patches, Still 23 years of neglect are sure to have taken their toll. If only Fred had spent less time on his Steam Engines and more time on his Land Rover's needs. Because Land Rover have always built these vehicles with the view to ease of changing parts between models, stripping it is quite easy, its just like a giant model, but everything we took off was proving to be far too bad to put back on again so nothing for it, we have to keep going deeper, and we have not even started on the V8 conversion yet. With the engine removed, we can now start to sort out the bulkhead and with this conversion the V8 will fit as though it was meant to be there in the first place. But first more panels have to be removed and it's all going to be built up on a brand new galvanized Chassis donated by Marsland Chassis - you can find their web site here www.marsland-chassis.co.uk RPi can supply all chassis options from Marsland if required. 1. With the front wings removed, it has revealed corroded chassis and body sections and a small garden plot on the top of the inner wing. 2. 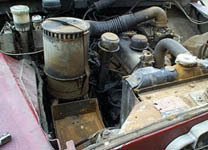 The floor panels are removed, the air conditioning in the chassis can easily be observed. It looks like this chassis is finished. 3. The interior is being stripped as more major corrosion is discovered, Looks like more major repairs are required, no worry, we will soon have it all under control. 4. The 2.25 engine shows a nice bright red light on the dash when you go round corners, perhaps Fred just forgot to put any oil in?